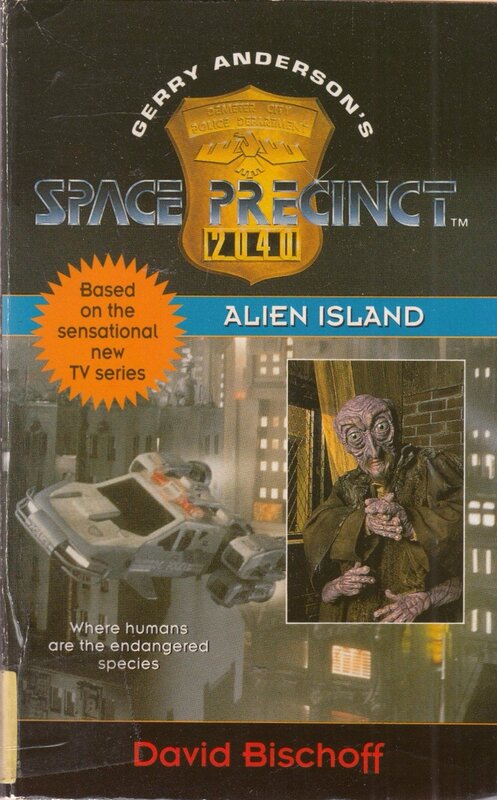 SPACE PRECINCT #3 ALIEN ISLAND BY DAVID BISCHOFF – THE BOOKS THAT TIME FORGOT. Patrick Brogan and Jack Haldane have been invited to the GOKS by Captain Podly. GOKS is the Gathering of Kindred Souls and is a club for police officers. Brogan and Haldane are the first humans to be honored with such an invitation. This club is exclusively for men only which triggers officer Jane Castle. So as the guys head off to Dreek Island for the annual weekend retreat, Jane and her partner Officer Took go to expose this male chauvinist organization. She also takes along an old flame that has returned to help. This flame may have exterior motives himself. It all ends with a plot by an officer Cradla who is planing to assassinate Podly and turn the other officers into mindless zombies to eventually take over the police force and eventually the world. So Jane Castle in this book becomes a radical feminist who sprouts endless speeches about the oppression of male patriarchy and gender equality. Wow this stuff was woke before woke was a thing. There is even a character who thinks he can’t “argue with the values and logic of political correctness.” Well isn’t that special. Well for all Jane Castle’s rhetoric she still gets all weak kneed when the handsome former boyfriend returns. Luckily this boyfriend is so sensitive that he agrees to help her. Of course the boyfriend is later revealed to be a robot that houses a small little alien. An alien that belongs to some secret galactic organization that promotes peace through extra-judicial assassinations of troublemakers. I had to admit that I didn’t see that coming in the book. Oh well the pitfalls of falling for the hunky sensitive guys. So anyway the threatening male behavior consists of the guys dressing as women. Having Catch stew which is dumping various insects, snakes and rodents on the floor and beating them with a mallet and throwing them in a pot of boiling water for dinner. Yum. Then they belch out songs and later go hunting dangerous alien game. These aliens are just some wild and crazy guys. So this was the last of the books of Space Precinct that Bishoff wrote or for that matter anyone else. Kind of interesting such an obscure series managed to get three books. The guy was definitely someone who could write interesting off the wall stuff. He apparently wrote many books, screenplays for TV series. He also wrote the greatest series in the history of human civilization Mutants Amok. Sadly he died this year. I am sure that I will run across more of his work. So God bless him for his wonderful works.